Madison at Main has been providing home decor and gift items for over 100 years. They have a large selection of indoor and outdoor rugs that will compliment any decor style and fit in any space. Most of the rugs that I’ve seen in stores are geometric or floral patterns. With rugs from Madison at Main, you will be able to make a statement with a rug that is unique. They also have a good selection of seasonal and pattern rugs. 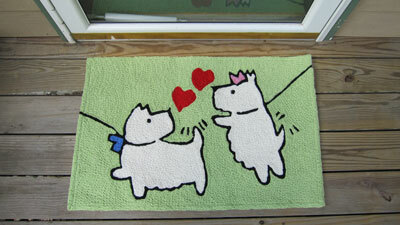 Many of the rugs are whimsical and fun. However, there is also a big selection of more traditional style area and accent rugs. Madison at Main gave us the opportunity to pick a Jellybean Rug for Our Virginia Home. There were a lot of rugs to pick from so it actually took me some time to find the perfect one. I decided on the Doodle Dog Jellybean Rug. Designed for indoor or outdoor use, the Jellybean rug is supposed to keep up with heavy foot traffic and is machine washable. With an anti-slip mat underneath, their rugs would work well at the side of the bed or in the kitchen. In addition to working as a rug, I thought it was cute enough to hang on the wall! The colors are vibrant and I love the texture of the material. Readers of Our Virginia Home will have the chance to win a Jellybean Rug from Madison at Main. You can select from any of the Jellybean Rugs. Enter using the Rafflecopter form below from July 31st to August 15th, 2012. The only mandatory entry is is to answer the first question while all other entries are optional. Our Virginia Home received a Jellybean Rug for the purpose of a review. However, only our honest opinions were expressed. I like the Doggie Bones – Embroidery and the Trick or Treat rugs. I love the El Ray Rooster and the Autumn Colors. Yes it is hard to only pick two! So many are great!! I like Apaloosa Foal, and Running Rover best. Then I like Black & White Paint Horses and Leo & DUmbo! And that’s only the animals! I like the Awesome Owl and the Autumn Acorns. I like the dolphin and horse foal jellybean rugs. I like the JACOBEAN FLOWER – SPA BLUE and the CAT WALK, Thanks! Oh I love the Autumn Acorns and the Beach Ball & Umbrella! My favorite rugs are the Autumn Colors and Doodle Dog!